I’m currently in a mid tech-week fog. We’re at that point of a production where the activity, stress and lack of sleep means the surreal tends to creep into my subconscious. This time it has manifested itself in an unusual fashion: I’m in love with a sofa. This sofa is in the show, and it’s an absolute scene-stealer as far as I’m concerned. Lightweight, which is important as it’s getting thrown about all over the place, but it still feels substantial. It can multi-role as both the parent’s sofa and the newlyweds’. The green-and-blue cushions offset the orange floor perfectly. It’s dead on the era. And it holds the space so well. I love it. As designers, we’re so often left at the behest of eBay. Whether it’s for the perfect wallpaper, dress or guitar straps, there are only so many trudges around markets, rifles through in-house stores, and hours lost to scrolling that designers and their heads of department can manage. So when I saw this sofa online… reader, I bought it. When a prop is the right colour, and size, and shape; when the movement director doesn’t hate you, and the actors feel good in/on it… that feels great. And on top of all that, this wonderful sofa also tells the audience the right story, as good props should. Some objects just have a sincerity to them. Float the right sofa out on an empty stage and see it pull its weight in the show. Watch the buoyancy, the scuffs and the bloody soul of it. People often laugh at my excitement about what stories ‘stuff’ can tell you. It’s like looking at your oldest toy, or your favourite leather jacket, or even your phone charger, which you thought you’d left in your other bag but hadn’t – tell me those things don’t have a kind of spirit and weight to them. But there can be a flip side to this. For instance, there’s also a table in this show, downstage right. It fits all the requirements: the right height, shape, and has a lower shelf. Listen, I shouldn’t be saying this. But I can’t help it: I hate it. That table has an angry look. It’s been painted far too many times. Zero stage presence. It brings me no joy. But it’s too late now. What am I going to do, sprint to Ikea on a lunch break? Send a stage manager out with the note for a ‘less angry’ table? That’s just the element of chance involved in sourcing, and all-round creating. Sometimes you get a sofa that you want to write a 500-word article about; other times you’re wondering if a tablecloth might cover it. Both number among the many puzzle pieces, or the brush strokes that make up the big picture. 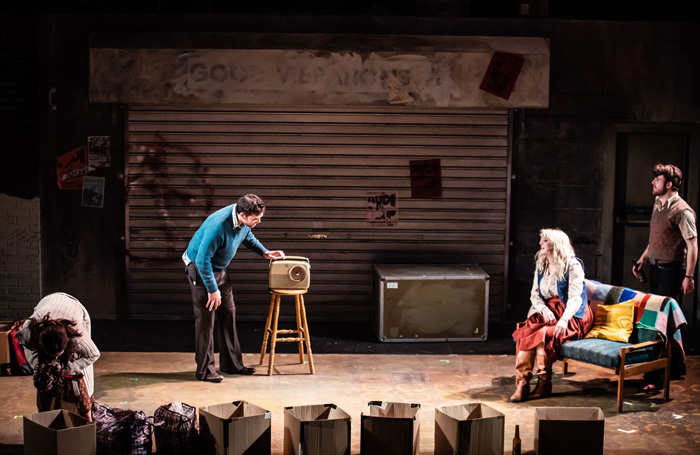 So next time you attend the theatre, and you get sucked into the story and are carried away by the actors and even the set design, spare a thought for sourced items. Each glass and sock has been painstakingly sought out and meticulously judged. Just like a wonderful actor, that object has auditioned, rehearsed and performed to get there.